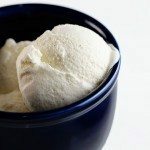 This no churn vanilla ice cream recipe is so simple to make that you’ll most likely find yourself turning to it time and again, even if you do have an ice cream maker! At least that’s what I do! 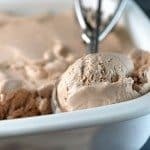 It makes a rich, silky, velvety ice cream that seriously tastes like ice cream we used to get at a local ice cream parlor. Learning how to make ice cream without an ice cream maker is pretty handy, I’d say. 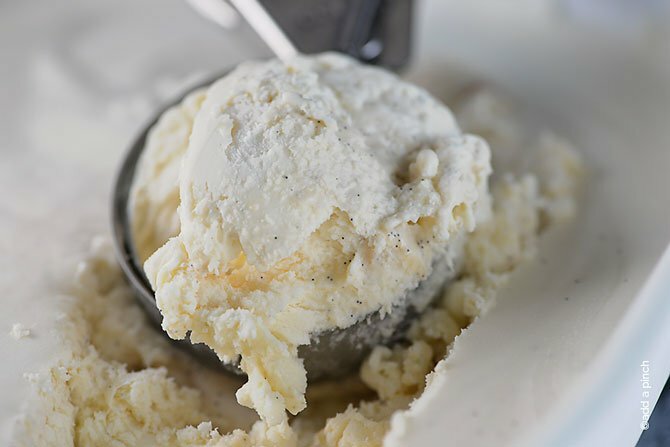 Three simple ingredients is all it takes for this easy ice cream. 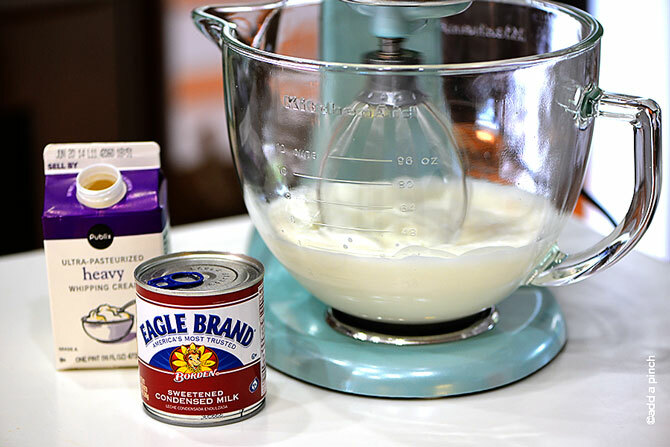 You’ll just need sweetened condensed milk and heavy whipping cream as your base ingredients. You’ll whip your whipping cream until stiff peaks form, about three minutes, and then fold in your sweetened condensed milk and your vanilla with a rubber scraper. For this version, I just added vanilla bean paste. It tastes just like the best French vanilla ice cream I’ve ever tasted. Once you’ve folded all of your ingredients together, just pour it into a freezer-safe container and pop it into the freezer to freeze. Then, once it has frozen, just grab a scoop and dig in! 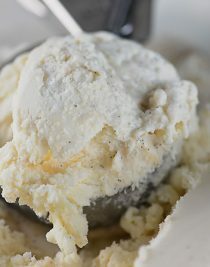 Here’s this super simple No Churn Ice Cream recipe. I think you’ll love it as much as we do! 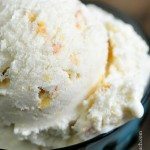 This no churn vanilla ice cream recipe is so simple! 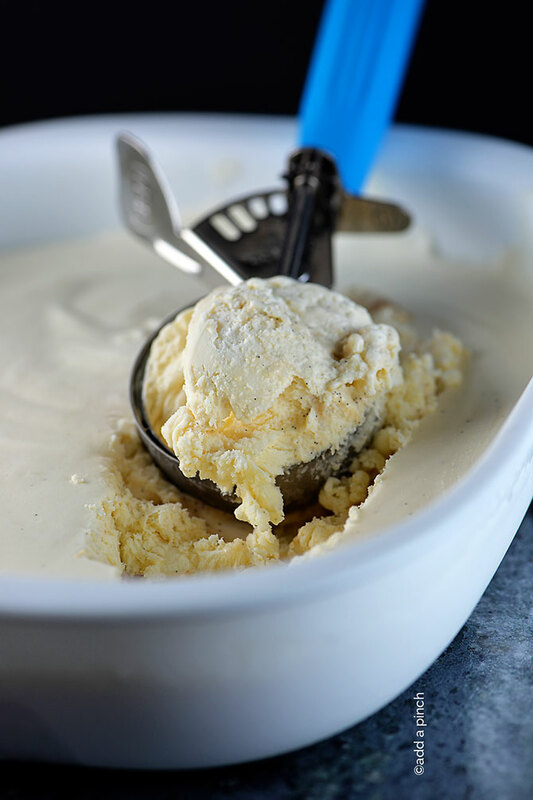 Three ingredients is all it takes for this delicious no churn ice cream you're sure to love! Whip whipping cream until stiff peaks form, about three minutes. 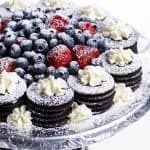 Pour in condensed milk and vanilla extract or vanilla bean paste and gently fold into whipped cream until well-combined. Pour into a freezer safe container and store in the freezer until the ice cream firms. Prep time does not including freezing time. It is almost TOO easy! Thankfully though, my son can have it whipped up and in the freezer in no time, too! That’s the best! Yay! I don’t have an ice cream maker and this looks perfect! I find myself turning to this one instead of pulling out my ice cream maker more and more often! I think you will love how easy it is! Really enjoy your recipes. Keep up the good sharing! This looks terrific! Do you think it would work to replace some of the heavy whipping cream with lowfat milk? That’s how I make all my churned ice cream. Thanks! I’m interested in knowing this too. I’ve not tried it, but I would imagine it would change the texture of the ice cream to a more icy texture. Otherwise, it should work. I love easy ice cream like this! Hi Robyn, I wonder what’s happened to your site. When I go to it I see all the categories on the very left side and the entire middle and right sides are blank. This is all one big long list (great for you) and then finally, we see your article. I don’t know if this is done on purpose or not. Please check it out and let me know what you think. Thanks. Lotsa luv! What a cool idea! I’m going to try this and add some fruit puree! I’ve got a big ole bottle of Hershey’s Syrup just waiting for this! You know I’m pinning it! What a great idea. So easy and I know it taste as good as it looks! Can you share some ideas for the freezer container…….size, brand, etc. I really appreciate any information. Thanks so much! Hi Mary! I use a variety of containers. This makes 1 1/2 pints, so I generally just grab a container that will hold that size. I love to use my plastic deli containers. I have both pint and half-pint sizes, so I just divide it between the two. I also use a loaf pan and just cover it with plastic wrap, or even disposable freezer containers with the plastic lids. Hope that helps! Let me know if you need any more information on what I use! Oh my gosh, this ice cream looks absolutely PERFECT! I’m kind of in awe that it’s no-churn too. I’m so trying this ice cream this summer! My family will love it. 😀 Pinned! I’m excited to try this recipe. Perfect for those of us that do not have an ice cream maker. I tried this ice cream and it was just as easy and delicious as promised. Thanks!! Hi Patricia! Great minds must think alike! I just posted the recipe for no churn chocolate today! Robyn, I should really be mad at you for putting up such an awesome recipe, but alas I love you more! I doubled the batch that I made day before yesterday and it’s almost gone! It is so delicious and easy as promised! My partner, who is very picky about vanilla ice cream, could not believe how creamy, rich and delectable it is. Now for the chocolate, yum! Thank you (I think) :-)! OMG I’m in love already and I haven’t made it. You had me at no-churn and three ingredients. I’m going to try this this weekend! I made this over the weekend, it was so easy and so good! Thank you so much for sharing your recipes Robyn! 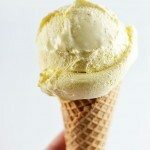 This ice cream looks so easy and delicious! Have you tried it adding other flavors or extra things to it? Would it still work? How long should the ice cream be in the freezer for? Thank you for the recipe, we are trying it today! Easiest ice cream ever! And so yummy!!!! Perfect soft serve vanilla ice cream. I did have to use the whisk attachment on the stand mixer to get the condensed milk fully incorporated into the whipped cream. I couldn’t seem to get rid of the cream “lumps” folding the milk in. Since the whipped cream seemed to be breaking down anyway I didn’t see what it could hurt. Turned out fantastic! Next time after I whip the cream I’ll just slowly add in the milk mixture with the mixer on low, let the machine do all the work :). I used homemade organic sweetened condensed milk (if you have a simmer burner on your stove it’s really easy to make) and 1 teaspoon of vanilla bean paste for half the vanilla. 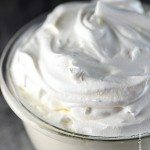 Can I make this using non-dairy whipped topping rather than whipping cream? I’ve never tried it using that Rose, but I don’t think it will work the same. Thanks!